Gov. Phil Murphy announced at a Thursday press conference that an additional 10,000 New Jerseyans received comprehensive and enhanced preventive health care following the restoration of $7.5 million for family planning services for the Fiscal Year 2018 and Fiscal Year 2019 budgets. Gov. Phil Murphy highlights the success of the restoration of $7.5 million for women’s health care and family planning on Jan. 31 in Newark. The funding restoration has allowed clinics to expand services and hours, bringing the total number of people served to nearly 110,000. “We cannot have a stronger and fairer New Jersey unless we ensure access to family planning services, to critical cancer screenings, and to prenatal care, for every woman, in every corner of our state,” said Murphy at the New Jersey Family Planning League in Newark. “These clinics are often the only health care providers that women encounter in a given year. They provide critical primary and preventive health care to patients—which is the foundation of good health,” Murphy said. Since the reinstatement and continuation of funding, the NJFPL has increased their network to 47 sites—including five additional centers now providing family planning services. The NJFPL funds 10 agencies that operate these 47 sites in all 21 counties throughout the state. The additional sites are Zufall Health Centers in Dover and Hackettstown and the North Hudson Community Action Corp. in Harrison and Englewood, as well as the DAYAM (Department of Adolescent and Young Adult Medicine) program at Rutgers University-Newark. “New Jersey’s Title X family planning clinics represent a critical pillar of the state’s health care system. 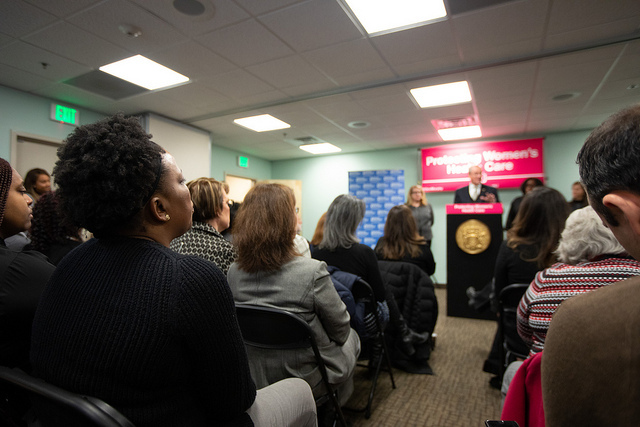 Thanks to Governor Murphy’s restoration of funding – the first piece of legislation he signed after taking office – thousands more women in New Jersey are able to get breast and cervical cancer screening, contraceptive care and more at the same place they get care for their children and families,” said New Jersey Department of Health Commissioner Dr. Shereef Elnahal. “The expansion of services at the facilities will ensure greater access to comprehensive care. Better support for our family planning clinics is part of the administration’s laser focus on health equity and closing disparity gaps. This is particularly important in our communities of color, where the disparities in maternal and child health are inexcusable,” Elnahal said. Family planning sites have also increased free screenings for sexually transmitted diseases by 40 percent, with more than 80,000 tests provided. In the last five years, the U.S. has reported a 22 percent increase in reported chlamydia cases and a 67 percent increase in reported gonorrhea cases. During this same time, New Jersey has seen a 24 percent increase in reported chlamydia and a 35 percent increase in gonorrhea. Given the increased incidence, additional testing and treatment is critical. Due to the restoration of funding, all family planning clinics will also begin to offer pre-exposure prophylaxis for HIV prevention (PrEP) counseling this year. PrEP is a daily medication that is highly effective at preventing the acquisition of HIV. When taken as prescribed, PrEP reduces a person’s chances of contracting HIV by more than 92 percent. The addition of this service gives clients another resource to protect their health in the same site they receive other health care. This initiative will expand access to counseling beyond the current PrEP program, which includes 31 sites throughout the state. Increasing the use of PrEP is part of the Murphy Administration’s commitment to end the HIV epidemic in New Jersey by 2025.